Although many varieties of plants, grasses, trees, and flowers grow in the wild without fertilization, this does not mean that the average Houston yard has anywhere near enough nutrients for landscaping plants. One reason for this is that man non-native plants used in professional landscaping often require more nutrients than a local yard can provide for any length of time. Even residents with some of the very richest garden soils on the Houston landscapeeventually realize that their plants are using up minerals that eventually need to be replaced. This law states that plant growth is either limited or increased by the available amounts of the necessary nutrients that are in shortest supply. It does no good to give the plant more of what it already has in abundance. Only by deliberately increasing the limiting nutrients can we stimulate its growth and vitality. 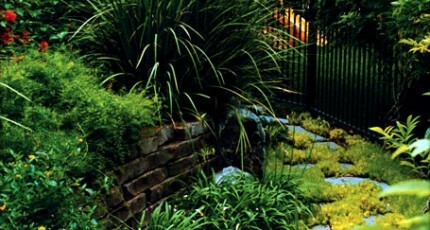 Everything type of plant on the landscape needs fertilization at some point in time. Garden plants need fertilizer as part of their routine maintenance cycle. Flowers also specific types of nutrients in the right amounts to produce the most colorful and vibrant blooms. 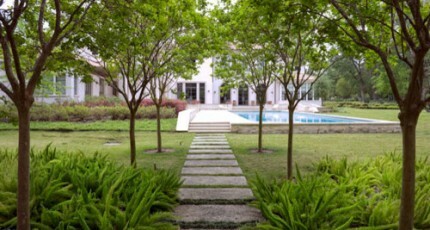 Lawns also need to be fertilized at quarterly intervals. In the spring, this helps roots begin their annual growth cycle. In the summer, fall, and winter, it helps store reserves that grasses draw upon when weather becomes less than favorable to their growth. The soil around trees especially needs periodic and very precise fertilization because trees are very heavy feeders that absorb massive amounts of minerals from the soil. Lawns must also be fertilized at regular intervals. Lawn fertilizer falls into four main categories: dry fertilizer, liquid fertilizer, synthetic fertilizer, and organic fertilizer. There are many different brands in each of these categories—so many, in fact, that the first time do-it-yourself landscaper may feel a bit overwhelmed. For this reason, we recommend that homeowners always call their landscaping company before they go out and purchase any product for use on their lawn. We also urge them to consider investing in a landscape maintenance contract that will include that include lawn fertilization either twice annually or once every quarter. Most fertilizers used on flowering plants are made with nitrogen, phosphorous, and potassium. These minerals are essential to the vitality and color of flowers. 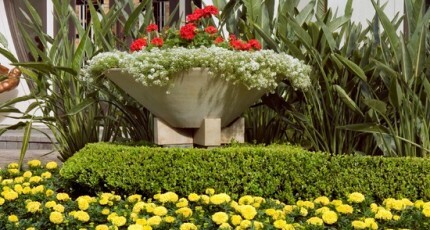 However, over fertilizing can easily wither and even kill flowers. This can be easily happen when people try new brands that promise too many things, like pest and fungicide control combined with plant nutrition. We do not say these products are bad, but at the same time, we do not always know what is in them, nor do we know what outcome they will produce if the ingredients and instructions are ambiguous to the average user. 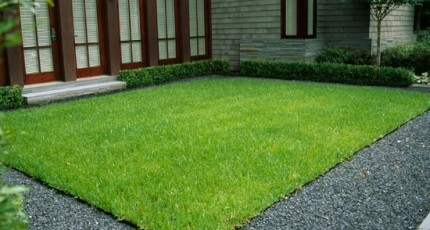 It is much safer to make a reasonable investment in professional fertilization services. After all, making a sizeable investment in garden design warrants an added measure of protection. Fertilizing of hedges is normally done once a year early in the spring to maintain full foliage and a presentable appearance. Hedges are heavy feeders and will deplete their environment without nutritional supplementation. The best fertilizer for hedges is a slow-release phosphorous or organic mix. Tree fertilization is by far the most complex and challenging part of landscape maintenance. This is because every tree species is very unique and has very different nutritional needs. In all fertilizers, there are two types of nutrients—macro and micro. Macro nutrients include nitrogen, phosphorous, and potassium. Micronutrients include iron, magnesium, and manganese. All of these minerals must be mixed in different amounts for different tree species. Always, always, leave this to a landscaping professional.